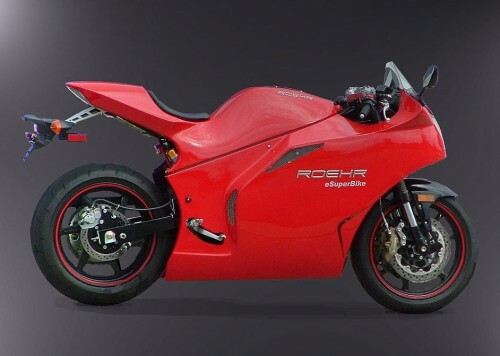 In what appears to be a red letter day for electric motorcycle model announcements Roehr have just announced the eSuperBike range capped off with the TTXGP race ready model, the RR. 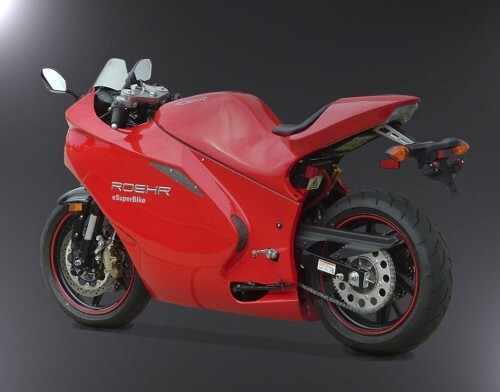 Roehr are offering 3 electric sports bikes, starting with the eSuperSport model with 48hp and a price tag of $16,965 USD. The next model in the line up is the eSuperBike with 96hp and a price tag of $27,595 USD and the TTXGP race ready bike is the eSuperBike RR with 96hp a price tag of $34,495 and a slew of built in features to make sure it is ready to rub shoulders with the top electric racing bikes in the world. “The eSupersport is the entry level of electric sportbike performance. Although it is entry level, it is first and foremost a sportbike, as such, it is equipped with quality suspension, brakes and running gear. From the 41mm inverted front forks, single shock rear suspension with progressive linkage, to the dual 300mm front brake discs and light weight 17 inch aluminum wheels with sportbike sized tires, this motorcycle reaches far beyond your typical entry level offerings. Power is provided by a single AC Induction Motor producing 48hp, and 8000 RPM capability. AC motor technology, with it’s higher efficiency, superior reliability and efficient energy regeneration has proven itself superior to it’s DC motor counterpart. “The eSuperBike embodies the ROEHR legend of power and performance. Simply put, the eSuperBike raises the bar for electric motorcycle performance to a whole new level. Powered by dual AC induction motors, producing 96hp combined with our high power 7.7Kwh battery pack will thrill you with arm wrenching acceleration, high top speeds and class leading range. The eSuperBike is also equipped with an Ohlins, fully adjustable, rear shock for exceptional response and performance as well as increased stopping power from powerful dual Brembo 4 piston front brakes. “The RR is our flagship electric sportbike, designed to race in the current TTXGP and e-Power racing series. 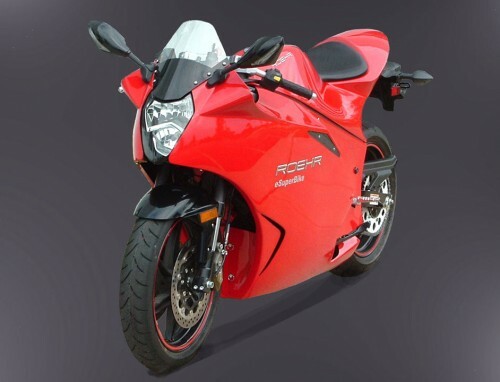 Based on our eSuperBike, the RR additionally features, 43mm, Ohlins, fully adjustable inverted front forks, 320mm Brembo brake rotors with 4 piston radial calipers, in addition to light weight aluminum racing wheels with race spec performance tires. We’ll keep you posted as further news about these great looking bikes comes forward. The selection of serious electric motorcycles seems to be expanding very rapidly, he’s hoping the electric car selection follows suit.